Crystal Serenity is in Trieste and Robin has had a very quick look around. Most of the day has been spent in preparation for the concert tonight. I have just been sent the programme, here it is, so we can all imagine ourselves there, enjoying the music! The observant amongst you will realise that this programme is about 40 minutes long. Robin has certainly been away a long time, and travelled to many places, for two 40 minute concerts! As the day progresses, it is easy for musicians to start to feel the tension mounting, in anticipation of their performance. Robin has an excellent way of preventing this. He loves walking and makes a brisk walk a part of every day. Today he was de-stressing with 14 laps of Crystal Serenity. This took him just over an hour, and was a total of 4.172 miles, apparently. He is now well and truly ready for the concert. Since my last post Robin has spent a very pleasant day in Dubrovnik. He called me at one point, to say he couldn't put into words just how beautiful it was. I've never known him at a loss for words before so can only imagine that Dubrovnik is a very special place. As he hasn't managed to resolve his 'technical' problems with his camera, I shall have to wait until his return to see the photographs. Today he is at sea, enjoying lovely weather and preparing for his second guitar concert, which is tomorrow. He has had a week between performances, so has been able to relax a little more than usual, which is rather rare for Robin. But in the last few days he has been running through the second programme at least three times each day, along with his usual scales and arpeggios, so I think he should be ready. Meanwhile I have been holding the fort back at home. I am delighted with the MySpace response, with over 500 visits in such a short space of time. I have met up with old friends, and made new ones, which after all, is the purpose of the exercise. As you know, Robin is away from home a lot. I therefore have to deal with his mail. So I was rather amused by a letter I received, addressed to, 'Sir Robin Hill'. Has he been honoured and forgotten to mention it? Surely I would have noticed him nipping off to London to see the Queen? I would have gone too, and purchased a hat, especially for the occasion. But, as it turned out, it was a letter from a very grateful student! Maybe I am turning into a travel writer after all, albeit an armchair one. Today Crystal Serenity has arrived in Corfu. So far, I have had very good reports about the beautiful island. There are many old buildings, churches, and forts, plus numerous narrow alleyways, containing interesting shops and houses. But unfortunately I can't show you any pictures. So unless Robin physically takes his computer out with him, and holds it up to try and capture these images, then we'll have to wait. Mind you, mad dogs and English men, maybe he should give it a try. It's now 4 days since Robin's concert, and his second one isn't until Wednesday, so it's rather a strange time for him. He has had plenty of time to practise and has even given an interview. Coincidentally, on board is a journalist, he loved Robin's concert and is very keen on the guitar. So he invited Robin to meet up for an interview. They did, and as far as I know it went very well. I'll let you know when I find out more details. When Robin has time on his hands, I do start getting strange messages. These helmets identified them as doctors, but also bore a resemblance to a ducks beak, hence the term, quack. See, it's worth visiting this blog, you never know what you may discover! Robin has a few days before his second guitar concert, so is able to relax a little, and enjoy some fantastic scenery. Late last night Crystal Serenity passed by an incredible sight. It was the Island of Stromboli, which is home to the worlds most active volcano. True to form she was spitting out lava as they watched. You can see the sort of images that Robin has just observed, here. After a restful night, Robin awoke to find a horses head in his bed, which the maid swiftly dealt with. But he has arrived in the small town of Taormina, Sicily, used in the filming of 'The Godfather'. He is currently exploring, and says that it is beautiful, mountainous, with little hill top villages in the distance. Don't worry, I'm not turning into a travel writer, I'm sure normal guitar practise will resume shortly. Meanwhile, Robin is on the lookout for Don Corleone. Robin's first guitar concert on Crystal Serenity has gone very well. His nails remained intact, much to my, and his, relief, and the audience were appreciative. Although he probably had the least relaxing, 'post concert relaxation', that he has had for a long time. Robin arrived at a big screen, just as United and Chelsea went into extra time, so he wasn't spared any of the drama. I think his already high adrenaline levels will have taken some time to reduce. But today he has gone into Sorrento, to have a look around, and I keep getting calls about how beautiful the area is. Although one call was slightly more worrying, as he asked me to look up 'Nicola Spoto'. Robin: "Can you look up Nicola Spoto for me?" Robin: "OK, I've found a fantastic shop, with an incredible mandolin, in a case...!" Whilst I pretended the 'phone had gone dead, I did look Spoto up. The best reference I could find was here, just scroll down the page and you'll see some nice pictures. Anna: "Are you still near the music shop?" Anna: "Good, because he made very nice instruments." Luckily Robin had decided that travelling home with his guitar, suitcase, hand luggage and a mandolin, may not have been practical. He bought a music box instead. Phew. Crystal Serenity has arrived in Sorrento and apparently it looks beautiful from the Bay of Naples. But today it will remain at a distance, as Robin is busy preparing, for his first guitar concert. However, tomorrow there may be the opportunity to have a look around before setting sail again. Robin has already completed his sound check, so now will be limbering up with right and left hand exercises, before running through the programme a few times. He is very pleased with a mute he recently purchased, as now he can practise without fear of annoying his neighbours, or having to stuff a sock behind the strings! You may recall the recent story of Philippe Quint, the Grammy award winning violinist who left his 285 year old violin in the back of a taxi. We have some idea of the torment Philippe will have been going through. 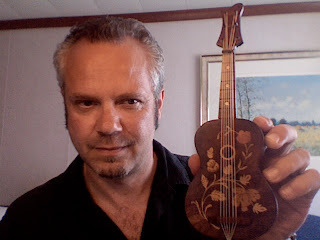 Back in March 2007 one of Robin's concert guitars went missing. You can read about the saga here. Whilst we had no idea where Robin's guitar was, Philippe saw his violin driving off into the distance, but was unsure if he would ever see it again. Restoring faith in humanity, the taxi driver tracked down Philippe, and returned the precious instrument. Now, Quint has given a special 30 minute concert, outside the airport, to show his gratitude. You can see an extract here. This story caught my eye as Philippe is a friend over on the new MySpace page! It has been remarkably quiet out in the Mediterranean sea today. Other than hearing that Robin had enjoyed a very pleasant alfresco breakfast, on board Crystal Serenity, there has been little news. I do know that the first of his two guitar concerts takes place tomorrow, so Robin will be hard at work preparing. This lack of information left me with time to contemplate the latest batch of unusual Google searches. Why has there been a sudden interest in cuckoo clocks? A number of different people have recently been searching cuckoo clocks and found themselves here. I can only assume it is due to one, or both, of these old posts. The first was back in January 2007, 'Pierre Petit and the Cuckoo Clock Pendulum', which looked at Robin's uncanny ability to judge tempo, acquired after many years of foot tapping. Or maybe it was, 'Cuckoo Clocks and Microphones', from 2006. Either way, I hope they found what they were looking for. There was another search that I haven't been able to figure out. "Robin Handel you can't Handel Me"
We have had a particularly busy weekend preparing for Robin's trip and keeping up with new friends on MySpace. Robin has arrived in Rome, after a very brief stop in Munich, in which he had 1/2 hour to reach his connecting flight. He made it, and is now making his way to Civitavecchia, where he will be joining 'Crystal Serenity'. More of that as the week unfolds. The new MySpace page is going well and I'm delighted with the response so far. When setting up the page we talked at length about the profile picture we should use. Should it be Robin alone, or, should I be shown, as I am obviously involved? We decided to take a few pictures to see what we thought. 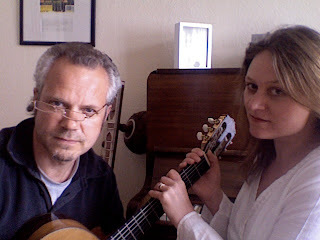 Those of you who have already visited the page, will have seen that we decided on a picture of the two of us. However, there was another close contender. We were really just having a bit of a joke. So if anyone has any strong opinion about the picture we should use then do feel free to let me know! I have finally finished the new site that I have mentioned a couple of times. We have now launched our MySpace page. For those unfamiliar with MySpace, it is a social networking website, which offers interactive, personal profiles, music, videos and blogs. For all musicians it is an essential marketing tool and you ignore it at your peril. With millions of users, and more daily hits than Google, the potential to keep in touch with, and to expand your fan base, is huge. Consequently I have been working on this for a little while, and now, at last it is ready. In only a few days our list of friends has been growing, and will hopefully continue to do so. So, go over and have a look. Feel free to leave a comment or message, or,'click' on any of the friends we have already made, so you can have a look at their pages. As it is interactive, the content will be constantly changing, so it's worth regularly visiting. Also, for those of you who have been following this blog for nearly two years now, but as yet haven't seen what I look like, all is revealed...well not quite all..
Just click this link: MySpace:Robin Hill and have fun! Usually, at some point in the day, I have a look at my favourite sites and catch up with other's thoughts. Yesterday, like most days, I read 'Kenneth Woods - a view from the podium', and his latest post, 'Chamber Music Thoughts in the Ischian sun'. In it he mentions talking to friends who have been invited to perform in a nudist colony, clothing being optional for performers. This prompted a thought pattern. Would he dis-robe to take his music to the people? I can't possibly put in print his response. I should point out that I did present the question as if an actual enquiry had been made. This may have been cruel, but, it was also rather amusing. However, I can relay a story that Robin told me, after he'd seen the funny side of the situation. Apparently, Django Reinhardt and Stephane Grappelli were once asked to perform at a private function. They were told that it was a very 'posh' affair, and that all the audience were naturists. The proviso for receiving the extremely good fee for the job, was that they also had to play naked. Once at the venue, they found that the host was indeed very affluent, and had provided a platform with curtains and a revolving stage for the occasion. (They entered the large room from the rear). Reinhardt, Grappelli, and the other two musicians, removed their clothing, and prepared for the stage to rotate, bracing themselves to meet their audience. The moral of the story I suppose has to be, that you should always read the small print in your contracts, and when 'unusual' requests are made, be sure to ask a lot of questions. Today is Robin's birthday and we are very lucky to have him at home to help him celebrate. The day started with the normal rendition of 'Happy Birthday', sung by all the family, as an early morning wake up call, followed by a present opening ceremony, before pre school chaos ensued. Once calm had returned to the house we decided to take some time out. This is actually quite rare, so was a real treat for us both. That's the beauty of having a birthday in the house, everyone gets to enjoy it! As it has been such a nice day here, we packed up a picnic, and took ourselves off for a drive in the countryside, and had a thoroughly good time. But now it's back to work. Robin is practicing his guitar. I have been dealing with agents about the forthcoming trips. Actually, I'm rather envious of some of the places Robin will be visiting over the next few weeks. Hopefully there will be plenty of photo opportunities coming up. But sitar mania does continue here. Have you ever heard 'Happy Birthday' on the sitar? It sounds great, even though the birthday boy had to play it himself, whilst the rest of us finished breakfast. I suppose that's the downside of being the musician. Not only is Robin still playing his sitar, but he is also listening to others play, and watching them on YouTube. Here's a example, it's Ravi Shanker giving George Harrison a sitar lesson...! Today the house has been filled with the sound of the sitar. As Robin enjoys his first day at home, he allowed himself to relax for a while, by playing his sitar. It's a beautiful instrument in every way, with an exotic sound and intricate decoration. As I worked this morning, he pulled up a chair, and proceeded to play, warming up with 'Norwegian Wood', and swiftly making up his own arrangements, particularly enjoying the sitar's ability to bend a note up a complete major third, and even beyond, which he did repeatedly. I'm not to sure that he even noticed me leaving the house for a couple of hours, in search of a birthday present for him, (it's on Wednesday) as he was still sitting there playing on my return. He did take a break at one point, made his way into the lounge, and watched a DVD of Ravi and Anoushka Shankar, just to keep the momentum flowing. There is an upside to a day off from playing his guitar. It allows his nails a rest. 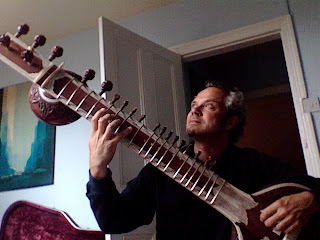 When playing the sitar you wear a mizrab on your finger, which is a strange device, and one that I find rather uncomfortable. I'm not alone in this, George Harrison once described wearing a mizrab as feeling like, "a weasel holding onto the end of your finger." I knew Robin couldn't stay away from the guitar for an entire day though. He's currently back in the music room and working on his right and left hand exercises. The QM2 has arrived in New York and Robin will be spending some time at JFK waiting for his flight home. I wonder if he'll see the lady in the toy shop again? The second concert went very well, and once again, it was a full house. Robin has received many nice comments, and also, lots of interest in his nails since the 'problems' of the first concert. In fact, one lady said that she saw what she thought was his nail, fly off when he was playing, but luckily, as I wrote the other day, it was actually glue and silk, but immediate repair was required. Still, it was a good talking point, even if it was one that Robin would rather have done without. I have added a few new pages in the 'Links' section so feel free to browse. Also, in the next few days I will be launching a new site I have been working on, so there's plenty coming up which I hope you will enjoy. There has been little communication from the QM2 so far today, mainly because of the time difference. However I do know that Robin spent yesterday evening dining with the cruise director and a few guests. He will be rehearsing most of today as his second guitar concert is tomorrow. As there isn't much to report from mid-Atlantic, and photo opportunities on board are rather scarce, unless you like sea and fish, I was lucky to have another unusual Google search. "If you were locked in room which had nothing but a tea-cosy in it how long would you wait before putting it on your head"
Now anyone that has only recently joined us here, may well think there couldn't possibly be a connection with this search, and a classical guitarist. Back in October last year I wrote a post, 'Cosi Fan Tutte', go over and have a look, to find out how Billy Connolly, a tea-cosy and a classical guitarist can in fact be linked. After Robin's recent guitar concert, on the QM2, you would expect him to relax and take it easy today. But, as always, there is another programme to work on, in preparation for the second concert, which is on Friday. Plus his usual daily routine of scales and arpeggios. I did get a message explaining, in great detail, a new hand position that Robin is working on. Apparently, by altering his right hand position very slightly, scales can be performed with more speed and less effort. I look forward to a demonstration on his return. It continues to surprise, and amaze me, that after all these years of playing, Robin still comes up with new approaches. I suppose the secret to any success, whatever you do, is to constantly examine your actions, assess their efficiency, and readjust as necessary. His email was titled, 'You can teach an old dog new tricks', so any students reading, take note. Whilst Robin works on his scales, I was amused to find that someone in America had done a Google search, 'Iguana with sombrero', and found themselves here. I am assuming that they have previously read this post, from back in February, and wanted to return to it. Yesterday Robin performed the first of two guitar concerts on board the QM2. It took place in the 'Royal Court Theatre', which seats 1000, and on this occasion the theatre was full. It isn't often that Robin is enthusiastic about his own performance, he's usually highly critical of his playing, but he was pleased yesterday. There was one 'nail' incident, which regular readers will know happens from time to time, and is always a guitarists nightmare. It was severe enough to actually stop playing, the nail literally became unstuck, and if Robin had continued, it would probably have flown off into the audience. He was playing 'Zapateado' by Sabicas at the time. He felt the nail give way. Explained what had happened, and generally chatted to the audience, whilst he re-glued it. Then started again, completed the piece, and was rewarded with a standing ovation. He actually received another one at the end of the concert, so I think we can assume that the audience enjoyed it. Later on he met a gentleman who thanked him for a "great" concert and went on to say, "I wanted to shout, quick, is there a manicurist in the house??!!" As the concert was held at 2.30 in the afternoon, Robin went off and celebrated with a large bottle of Perrier, followed swiftly by a strong coffee. Those of you following on Twitter will already know that Robin has gone off on his travels once more. After three weeks at home it was rather a wrench for him, but, he was also ready for the challenge of two, high profile concerts, in the next week. After a busy weekend, with three performances in two days, it was rather a weary musician that set off on Sunday morning. Luckily, there wasn't a long haul flight to face, merely a quick hop down to London. Frankly, for Robin, that is rather like catching a bus into the nearest town. It was with some concern that he arrived at Heathrow, Terminal 5, and waited for his luggage to materialise. There has been such a lot of bad press recently surrounding Heathrow, that I'm sure most people would be anxious. However, his suitcase did appear, and he made his way to the meeting point to be collected. Still, on this occasion, his driver was an interesting chap. When he found out that Robin was destined to join the QM2, he recalled his own experiences, working in the boiler room of the original Queen Mary. 4 hours continuous, back breaking work, of shovelling coal into the hungry beast, then 8 hours rest before starting it all over again. But it helped pass the time on the journey, and eventually Robin made it on board Cunard's QM2. He just had time to settle in, coincidentally in a room he has stayed in previously, before setting off to record an in house T.V. interview, to be broadcast today. This often happens, as it allows the many guests to see what is coming up in the next few days. I know there was an explorer also being interviewed, but information has been patchy so far. It takes a while for email to be set up, and, once the ship is more than 2 miles form coast, we can't talk on the 'phone. Today is Robin's first concert. So he will be busy practicing and preparing himself, along with a sound check at some point. In the meantime, if you're in the UK, enjoy the bank holiday, anywhere else, have a good Monday! Recently we have been looking at the various tracks on 'Arrival', and neglecting the day to day life of this particular musician. Well, as always, there has been plenty going on. Robin has been practicing for many hours, every day, as you would expect. But, if you've been following the 'tweets' you will know he has also been preparing new pieces, composing, thinking of new CDs etc. All of these activities are an essential part of the process when an active musician. Also, you'll be pleased to hear, that Robin has been enjoying life at home. Just having time with the family brings a great deal of pleasure. But he's more than ready to perform for an audience once again, which is a good thing, as today he has two separate private functions, one in Yorkshire and the other in Cheshire. Whether he'll be home between the two I'll have to wait and see. Robin is also playing tomorrow evening, and then flying off on Sunday morning. I am constantly looking for new and interesting ideas to add to the blog and make your read more enjoyable. Twitter, which I added not too long ago, and have already mentioned, is an ideal way of updating with little snippets of information. But it seems it can also help in more serious situations, read this CNN report, 'Student 'Twitters' his way out of Egyptian Jail'. 'Prelude and Fugue in E major' is the final track on 'Arrival' and was written by the Italian composer Mario Castelnuovo-Tedesco (1895-1968). Tedesco composed many important works for the guitar, mainly as a result of his friendship with Andres Segovia. It was Segovia who introduced Tedesco to the Presti-Lagoya Duo who inspired him to compose a set of twenty-four preludes and fugues for two guitars, in the early 1960s. 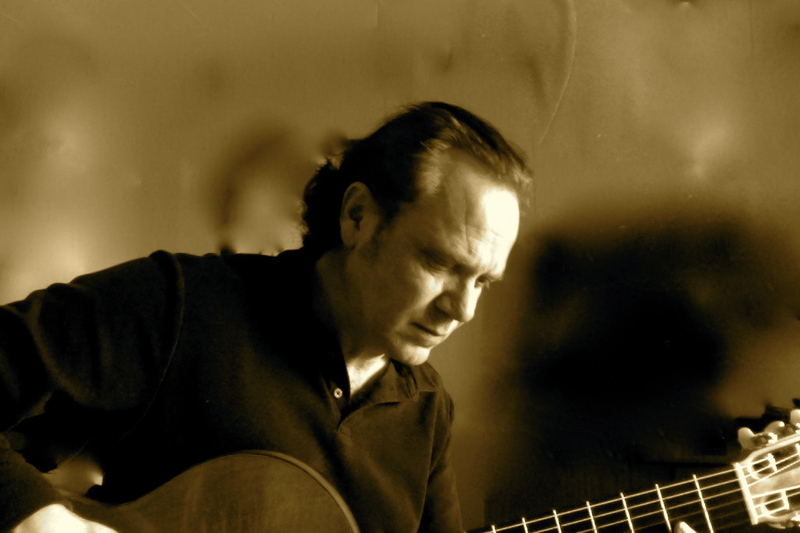 In addition to his guitar composition, Tedesco composed in almost every conceivable form. After his prudent flight from Italy in 1939, he lived in Beverly Hills, California, where he was employed by MGM studios, and worked on the scores of more than 200 films. He became one of the most sought after composition teachers in Los Angeles, with pupils including John Williams, Henry Mancini and Andre Previn. To read more on the life of Mario Castelnuovo-Tedesco, follow this link.